Hearing Hero Reviews - Is it a Scam or Legit? Hearing Hero is a hearing aid that utilizes two hearing settings as well as a volume control to help you hone in on exactly what you want to hear. The behind-the-ear device uses an amplification unit that hides behind your ear and connects to a soft plastic earpiece via a tube that carries sound from the amplification device to the earpiece. The company behind Hearing Hero is New York City-based TrekFirst LLC, who says they created Hearing Hero because they wanted to “combine technology with human connection.” According to records obtained from OpenGovNY.com, the company seems to have started in late 2018. In our review, we’re going to examine how this new company's Hearing Hero hearing aid works, talk a bit about hearing aid science and then discuss how much the hearing aid costs. We’ll also include a section comparing the Hearing Hero to other hearing aids. As we point out in our guide to which hearing aids are best, most hearing aids work in the same way. An amplification unit senses sound and amplifies it according to its own capabilities and any custom settings you’ve adjusted. The sound is then sent out to a tube leading to the earpiece, as is the case with the behind-the-ear Hearing Hero, or it transmits it straight into your ear canal if it’s an in-the-ear hearing aid. The Hearing Hero takes this process a step further by giving you “N” and “T” options. By setting the hearing aid to T, it will reduce bass sounds and increase treble sounds. This setting is good for situations in which you’re talking with someone and there’s a lot of background noise. The hearing aid will focus on the sound coming from the person talking and block out, to some extent, the background noise so that you can hear the words that matter and not lose them in a sea of ambient noise. The device also has a volume dial that you can turn up or turn down to match your preferences. As for who this device is good for, it’s important to understand that there are two main situations in which you suffer hearing loss: conductive and sensorineural. Conductive hearing loss includes things like wax buildup, foreign objects, ear infections, ear trauma and structural malformations. Sensorineural loss, as we point out in our hearing guide, relates to multiple situations that include exposure to loud noises, aging, genetics and structural malformations in the inner ear. The Hearing Hero, as well as hearing aids in general, can help with sensorineural hearing loss and some conductive/sensorineural loss, whereas experts have told us certain conductive hearing loss scenarios should only be fixed via medical procedures done by professionals. At the time of publishing, there wasn’t much information about the Hearing Hero on its website. We do know that the hearing aid uses A13 batteries. Pro tip: It can take up to three weeks for your ears to get used to the hearing aid’s assistance. There is one main feature of the Hearing Hero that should cause you to take a few minutes to think about what you want out of your hearing aid: shape. As we mentioned earlier, this device is an over-the-ear hearing aid, which means the amplification unit will site behind your ear. It sends sound through a clear tube down to an earbud that fits into the entrance to your ear canal. The drawback of this type of hearing aid is that’s not quite as discreet as an in-ear hearing aid that has no parts that sit on your ear lobe. Now, it’s also important to keep in mind that expert audiologists note that going to a professional to get a hearing aid means that you’ll most likely have the opportunity to get a device fitted to your particular ear. Variations in the distance between the side of your head and your ear lobe dictate how the Hearing Hero will fit, as will the size of your ear’s circumference. Based on this information, it may be best to make an appointment with an audiologist who can recommend a certain hearing-aid shape and style that would be the best fit, so to speak, for your specific situation. At the time of publishing, you could buy a Hearing Hero for $149.99 as well as a six-pack of A13 batteries for $19.95. Shipping for all hearing aids is free. We like that the device has one price and a simple checkout process. There are no gimmicky sale tactics – what you see is what you get. We read through the fine print and discovered that it could take up to 30 days from the date of purchase for you to receive your hearing aid(s). The fine print also revealed the device’s return policy. According to Hearing Hero’s terms and conditions, you have 45 days “from shipment date” to start a return. We tried calling the company’s customer service line to find out of “shipment date” referred to the day the hearing aid ships from the company or the day it arrives at your home. We waited on hold for 20 minutes before giving up. Another key aspect of the fine print is that they won’t allow a return until you’ve used the hearing aid for at least 21 days. So, if the return period starts when the hearing aid is delivered, then you definitely have enough time to give the hearing aid an extensive test run to see if it’s a good fit. However, if the deadline starts the day the hearing aid is shipped and it takes a week or so to arrive at your home, then you’ve got a smaller window to make your return – 17 days instead of 24. One of the best ways to figure how good a product’s pricing and features are is to compare it to other similar products. Doing so helps you see if you’re really getting a good deal or if there are other options that provide better value. Each one of these hearing aids has four different sound settings to cater to the particular situation you find yourself in while you’re trying to listen. Two of them have noise-canceling features, too, which eases the auditory load when you’re in loud environments like restaurants or public transportation. However, as you can see from the pricing, these hearing aids cost twice as much as the Hearing Hero. Because there were no customer reviews of the Hearing Hero at the time of publishing, we can’t give you insight into user’s experience, which means we can’t really tell you if it’s worth it to pay more for the top-rated hearing aids on Amazon. That being said, we were able to find several hearing aids that resembled the Hearing Hero but were significantly cheaper. For example, the LAIWEN Digital Hearing Amplifier has the same options as Hearing Hero (two sound settings, volume dial) and cost $59.99. At the time of publishing, the LAIWEN had four customer reviews for an average of 4.5 stars. Based on our research, we believe there are some important things you should consider before buying Hearing Hero. First, information on the product’s website is limited and it was hard for us to get in touch with customer service. Therefore, it’s hard to say what the hearing aid ships with. Based on what we’ve seen from other hearing aids like this one, it will most likely come with multiple sizes of earbuds, which is good for finding the right fit for your ears. Furthermore, important things like sound quality (digital or analog?) and amplification power (how many decibels) are unknowns. Second, it’s really hard to come to a conclusive position on the value you’re getting by spending $149.99 on these hearing aids. We do know that hearing aids with extra features are twice as expensive on Amazon, but, on the other hand, there are simpler over-the-ear hearing aids that are significantly cheaper than Hearing Hero. On top of that, the hearing aids we compared are part of Amazon Prime, which means you have a much wider range of return options than you do with Hearing Hero. I purchased one hearing aid. When it came I read all the instructions. I used the hearing aid for 21 days. It's very large and uncomfortable. It did amplify sounds. When the 21 days were up, I decided to return the hearing aid for a full refund, as advertised. I send an e-mail asking for instructions for returning it. A day later I got an e-mail back giving me the option to keep it and get a 30% refund. I did not want to keep it and requested the instructions (again) to return it and get the authorization number (which they require or you lose 20%). A day later I got return instructions, but without the needed authorization number. The following two days I sent additions requests for the number, but got no response. The company seems to have a lot of problems. I can't get a straight answer for shipment, every time I call they keep saying give them two more days. Seems like a ploy. I will give them until Friday the 22nd to respond and will let you know! 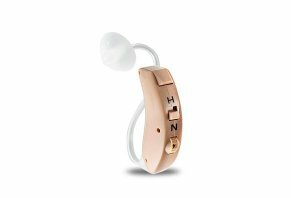 Write a Review for Hearing Hero!